For years we’ve been talking about the Conservative wing and Establishment wing of the Republican Party. I don’t want to minimize conservatism here, but conservatism is actually undergoing some redefinition right now, and that redefining has been caused by the impact of the election of Donald Trump, splitting some intellectual conservatives away until they can reassess just where “the People” fit into their intellectual scheme. So for now there is a People’s wing and an Establishment Wing, with some conservatives flitting back and forth between the two, some distinguished by issues, others, by body odor. The historical truth is that for the longest time there was only the “native” or “people’s” conservatism in the land, having nothing to do with national banks, tariffs or even foreign affairs. I’m not sure if most Americans at the time even knew Tom Jefferson had sent Marines to raid the Barbary Pirates in 1805, or for that matter, just where Africa was. The America De Tocqueville described was of a common thread running through almost all the people, whereby a man and woman could marry, raise a family and build a house (acquire property); some by turning forty acres into corn, others by opening a feed store to sell that corn, and still others with bigger dreams, to build grain elevators to sell that grain throughout the state…then passing what was left to the next generation. The processes Americans could go through to make those choices, risk or fail, formed the core of the common thread that still marks most Americans today, and it carries the weight of the bond people have found with that “man in the trades”, Donald Trump. This phenomenon is much easier to understand if you also understand it was the people who found Donald Trump and not the other way around. The rise of the People’s wing has been because their free choices have been threatened. For some it was open-borders, for others the loss of disposable income to pay for a poorer range of medical choices than they once enjoyed, still others higher taxes to pay for a government that never gets tired of expanding and intruding into their lives. What are black side darters or delta smelt, anyway? Americans have never liked being pushed around. So, after a long absence, the people’s “native conservatism” has come back into political vogue, center-stage. And many conservatives consider this to be a good thing, a godsend, in fact, including this holdover from the William F Buckley Telephone Directory School of Conservatism. It does require some effort. Our purpose here is to insure those voters “make themselves relevant again”, so that they can exercise real power in insuring that our elected representatives actually do what the People’s wing of the Republican Party have commissioned them to do. They are notorious for not keeping their word. What this proves is that the Trump wing of the Republican Party is invested with a kind of character which the politically-settled Establishment is largely lacking. Substance over style. What we all know, in various periods of American history it was vitally important that this character of the People, versus the political skills of the Establishment, was able to shine through. National survival rested on it. Trump voters already knows this. We always knew the chief impediment to actually achieving our objectives would be the Republican Establishment-wing. This is why we hired Donald Trump in the first place, to replace survival-endangering politics with survival-enhancing common sense, to first and foremost set the ship of state aright and drain the swamp. So naturally, we expect the Congress to balk. Like most mules, first we have to get their attention. (Two-by-four’s optional.) Some may have to be pushed and maybe a few even put out to pasture. But eventually they will learn they are no longer in charge in quite the way they thought they once were. Politicians are for hire, and the people gave them a job to do, a job they begged the people to hire them to do. So now they will have to carry out that job, but not as they now define it but in the original intent of the promise. So, this was never going to be an overnight undertaking. The good news is that the ruling wing of the Democrat Party has lost touch with almost two thirds of their party, there is 1) time to whip the GOP into shape, and 2) new fields to hoe in otherwise barren Democrat fields. There is a BEST WAY. In all likelihood…probably the only way…is to go inside the Republican Party and redirect it from within. You see, the basic relationship between the voters and their representative was severed many years ago. Once upon a time you could write a letter and every congressman had someone send a polite reply and keep count of what was on constituents’ minds, yea’s and nay’s, and then compare with the congressperson’s inner circle of donors and adviors. That was the 1960’s, but now it has gotten more sophisticated, with email, Facebook and Twitter, but the math is still pretty much the same. Unless you and at least 60% of the voters are (aggressively) against something the congressman is urged to be in favor of by his inner-circle, and there are “political dollars” backing that up, he is generally going to go with where the dollars are. He will do this because he thinks he can get our vote anyway. Congressman need the voters in order to keep the job, but have to keep the voters out of the loop and out of the way, so over the years, with the help of the state and national party, have found ways to make that voter’s power less and less potent.. He still needs our vote, and always come’s a’calling with flowers and candy just before election time, but he also knows from statistics that no more than 15% of us show up in a primary and that most voters pay no attention to how their congressman is performing 22 1/2 months of the 24 months they pay him to be there. Then came Dave Brat in the dead of night to steal Eric Cantor’s seat away in a primary, in 2014, and now Donald Trump, empowering those same people nationwide, proving the people are paying much more attention that first thought. Still, Congress men and women believe there is very little “the people” can do to prevent them from holding onto their job and their political perquisites once they go into a general election and the opponent is a Democrat. And they rely on local rules and the state party to get them there. In short, they are still largely unafraid. So, I say, give fear a chance. ….for in truth, voters from the People’s wing of the party generally represent the majority of the district’s voters, and will better represent them than the Establishment wing, as proven over the past several years. This may not be so in Delaware, or any Democrat-blue district, but since Donald Trump proved that many Democrats who had been cut loose over private sector jobs, and other “native conservative” issues can still find a candidate who represented their concerns, we know there is a buried demographic that both Democrats and GOP-e were hoping would remain buried…all waiting to find a political home, all based on those ancient tenets of grass roots American conservatism. Every state GOP party system is different, but they are all based on committeemen, or women, representing each precinct. Fill those seats with like-minded people, and in most red states, count on taking at least 40% of the party’s voting power. And even more in blue states. The entire complexion of the Republican Party will change, simply because of those precinct committee seats being filled by members not of the Establishment. As will Democrat-blue districts, once they find a new door-to-door salesman on their turf. That is real political power; to be able to back up the election vote with the threat of the rolled-up newspaper if your elected pup doesn’t pay attention. All that is needed is for the Trump base; from Arizona-lawyer-to-Charlotte-Hallmark-Cards-store owner-to-Omaha-small-manufacturer-to-Nevada motorcyclist-to-Denver-city-cop-to-Ohio mom-and-pop-retiree, to work with a common purpose and tighten that common thread inside the Republican Party apparatus. It can’t be accomplished any other way. Become a part of management. The vehicle is the Precinct Committeeman Project, headed by a friend, that Arizona-attorney I just mentioned above, his name Daniel J. Schultz, aka ColdWarrior. He’s worked with Steve Bannon and is Brietbart’s go-to columnist on taking over the GOP from within. I once watched him stand Herman Cain up straight in his chair in a 2010 private hotel briefing about the possibilities outlined here. He’s been my friend and UnifiedPatriots’ friend since our days at Red State. ColdWarrior is the last word on HOW-TO mobilize teams of GOP committeemen and -women, however a state party sets up its districts. In the GOP as many as 50% of those slots are open, and while Dan’s been able to get single individuals to enlist, it’s been very hit-and-miss because of the inability to launch a national program. His 11-minute video, delivered here by the old-fashioned form of 3 x 5 index card, bullet-point presentation, is my favorite. In 2010, the objective was slightly different than now. We were also targeting GOTV (Get Out The Vote) as a way to stack the GOP with conservatives in all those empty precinct committee seats. But Trump has opened brand new vistas not to just the Republican Party but to the entire Make America Great Again menagerie, because I’m willing to wager that as many as 30% of the Democrat Party is willing to take up residence elsewhere, while as many as 20% of the unaffiliated. never-bothered-to-register-to-vote crowd, including many African-Americans, may find it finally worth their while to vote their jobs-and-family interests. 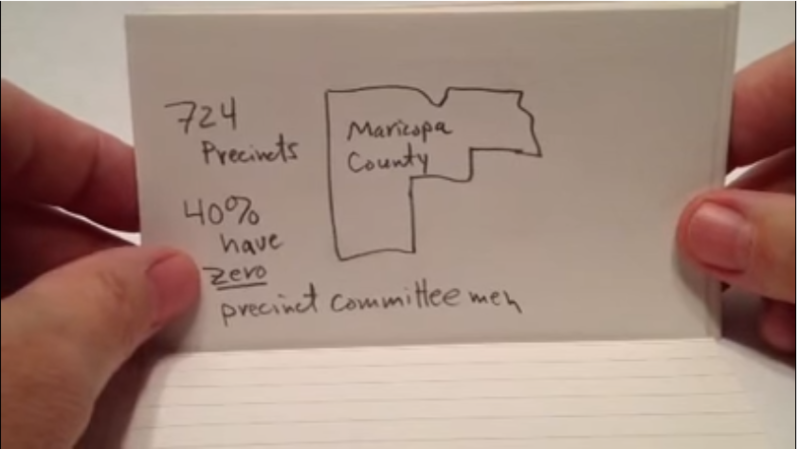 See the Maricopa County (Phoenix) index card photo from ColdWarrior’s 11-minute presentation (above). That was in 2013. In 2010 the number of empty precinct seats were much higher, and with our visit with Herman Dan was hoping to bottle the process that would reverse it. Donald Trump has proved every assumption made by ColdWarrior to be true. Maricopa County is made up of parts of seven (7) congressional districts of Arizona’s nine. Five of Arizona’s congressional districts are Republican and four are Democrat. Each congressional districts is made of approximately a population of 700,000. This is the rule nationally. But comparing the total voter turnout in the 2016 presidential election with prior elections shows that an awful lot of people showed up to vote no one really expected to show up. This seems to have been a trend nationally, for Trump seemed to be able to find voters who were invisible to both parties. Then consider the number of young men and women from those households, many historically Democrat, ages 18-25, who never bothered to register, much less vote, but found Trump reflected their values, usually about jobs…and whose job prospects have improved. The People’s Wing inside the GOP has every reason to go and find them and lure them over. The tap root of the People’s oak tree inside the Republican Party will be those empty Precinct Committeeman seats…now available in virtually every voting district in America. Donald Trump, and the deciding role of the “people-factor” has suddenly made those possibilities attainable. Don’t think of being a precinct committeeman as a (boring, thankless) individual endeavor, but as the vanguard of a team effort with a specific mission to conquer the Left and return the Party to its original brand. Donald Trump will prove that the “people’s conservatism” is the only way a free republic can move forward and that all other forms of conservatism will remain secondary. But it can’t be four-and-done. Or even eight. It will be more likely a fifty year process. We know several conservatives, some even 2016 candidates, who already know this, but who lacked the necessary skill sets to make it actually happen, in part because they were incubated and hatched by the same political system the people believe does not really reflect their pursuits of life, liberty and happiness. With the election of Donald Trump the people have rejected both the Republican establishment’s view of governance as well the leftist dreams of a managerial utopia. Depending on your definition of how to measure representative democracy, we believe that as many as 40% of the American electorate are nn-represented in the American Congress today. With the precinct committeeman project, there is a platform to begin gathering those all those voters under a single party umbrella. Next post After Hitler: Is Europe Returning to Type?